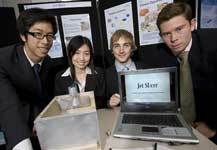 Manufacturing Engineering students at Cambridge University held their 2007 Design Show, displaying a range of new products that they have developed as part of their course. BrailleBelt saw a need to develop a portable device that would capture an image containing text and output the information in either audio speech or Braille. The reading material could be anything from newspapers to novels, from cereal packets to medicine instructions and could even include electronic displays such as microwave LCD displays. BrailleBelt is now focusing purely on the Braille output technology. 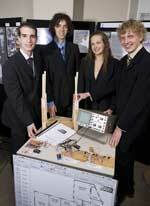 The students developed a method of producing a refreshable Braille display on a small and flexible belt. New and existing Braille products can use this device, allowing continuous reading and true portability. There are currently no commercial products that use a Braille output device smaller than around a foot wide and the team believes its innovative technology can enable the world to make pocket-sized Braille output devices. The Clean Cup Sauna: no more plastic cups, no more washing up: an eco friendly cup cleaning solution. This team developed a radical new solution for office workers who enjoy a hot drink but are too busy to wash up. Unlike a dishwasher which is time-consuming to run, or disposable cups which are unpleasant to drink from, the Sauna would be a drop off for dirty cups, cleaning and storing them, ready for re-use. Designed to use 85% less water than a traditional dishwasher the machine would be cost effective and eco-friendly. The Easy-Rise mattress will address the needs of elderly people who have difficulty getting in/out of bed, and sitting up. Its key feature is that it is incorporated into a mattress. This will provide both portability, comfort and will also fit with the style of the bedroom. 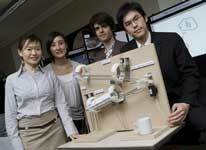 It will enable the user to sit up in bed for prolonged periods of time to watch TV or read. The intention is to create a product that will cost considerably less than the current bed raisers on the market which the team believes are far too expensive for many elderly people to afford. The main target market for easy-rise is the elderly but there is also a potential opening in the luxury market, for those who want an easy way of sitting up in bed. The Driftboard will allow snowboarders, both professional and beginner, to experience the feeling of carving powder without the need for snow. The board will be suitable for use on slopes with a relatively smooth terrain, such as tarmac. 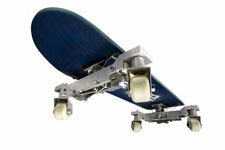 The Driftboard consists of a flexible deck to allow shock absorption attached to our unique Drift-fx trucks. 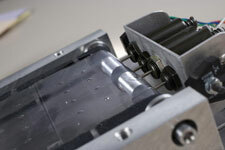 The trucks allow full 360 degree motion to be achieved with the board by the use of specially engineered castors. To enable the ‘carving’ effect the castors will be directionally biased based on the relative angle of the board. This will recreate the responsiveness shown by snowboards when turning using the edge of the board, replicating the variable bite felt on snow. ActivBack is a unique new way to improve technique and reduce the chance of spinal injury, ideal for sportsmen and women looking to gain a competitive edge. Activ-Back offers unparalleled freedom of motion to the user, unlike existing products which are restrictive and cumbersome. By using a novel approach to posture measurement, the team believes it could produce ActivBack at a much lower cost than those products currently available. AgentWand is designed for Estate Agents who need to produce professional and accurate floor plans for clients quickly and efficiently. There are two components to the device; a ‘wand’ carried around to key features of the room (e.g. corners, doors etc.) and a ‘base station’ that precisely locates these features. Using multilateration techniques, the base station locates the feature co-ordinates from ultrasonic pulses emitted by the wand. Advantages over conventional products include: rapid plan production, provision for complex, non-rectangular rooms and less room for human error. SocketSaver: An energy saving device which detects standby mode, switches the power off, and can be turned back on without effort as soon as the appliance is needed. 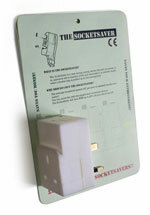 A device to be used between the plug of an electrical appliance and the wall socket in order to minimise energy lost on standby mode. It is estimated that household electricity bills could be cut by up to 20%, saving the average household £37 per year. The SpeedSmart system is an intelligent speed calming system designed to alter the behavior of drivers by giving regular visual feedback and rewarding those drivers who adhere to the speed limits. The SpeedSmart system uses the latest Automatic Number Plate Recognition technology to calculate the average speed of the vehicle throughout the system. The driver is alerted to whether their speed is safe or not via visual feedback signs located along the roadside system. A dedicated traffic signal is located at the end of the SpeedSmart system and will turn red and stop speeding vehicles. The amount of time that the vehicle is stopped is proportional to the average speed of the speeding vehicle. A sign located at the traffic light displays the speeding vehicle’s registration number, average speed and counts down the waiting time at the traffic light. 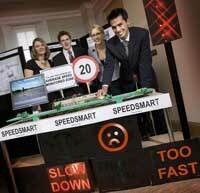 The innovative SpeedSmart system is designed to alter drivers’ behaviour, and aims to lead the non-prosecuting speed calming market. The Buddy Umbrella is an innovative design set to challenge the traditional model of the standard umbrella. Encompassing both the notion of quality and fashion into a single executive umbrella, the revolutionary opening-closing mechanism aims to provide the user with ample protection in the rain and after use. A novel, hygienic and safe alternative to kitchen knives. This water jet slicing machine efficiently slices food, including raw meat, into multiple strips ready for cooking. This product will reduce preparation time for repetitive slicing jobs, and could provide a new set of possibilities for the creative chef. 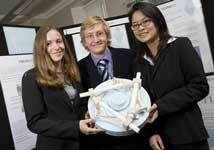 A redesign of the Iskra Wind Turbine to reduce manufacturing costs and improve ease of use.